If you've attended my Saturday Academy classes or OSCON presentations, you may have heard me speak about, and possibly demonstrate, Elastic Interval Geometry (EIG). Unlike static geometry, EIG unfolds in time according to a precise and deterministic algorithm, but not in any way that's easy to predict short of running the EIG engine -- at least not if the structures are at all complicated. Gerald de Jong was inspired to develop EIG by a Kenneth Snelson sculpture (this tower) near his home in Holland. Later (if I have the chronology right), he turned in to Bucky's Synergetics, through which he met me, among other afficionados. I still have some Hi8 videotape from the time he flew out for a JavaOne event in the Bay Area, and afterwards stayed with me in Portland. We drove up to Seattle for a big synergetics pow wow at the viewcrest home of Russell Chu and Deb Kasman MD. John Braley and Karl Erickson were among those present -- old timers on my Synergetics-L which, along with Geodesic, was probably the first synergetics-focused list. Anyway, what triggers this trip down memory lane is the fact that Gerald has recently launched this new Internet domain and blog, to serve as a platform for his ongoing explorations of Elastic Interval Geometry (EIG). So after a blue sky Wanderers' this morning, during which there was much talk of urban flora and fauna, possums, the ocassional wayward coyote and such, three of us adjourned to my garage for further brainstorming. How could our east side produce row host veggie-loving think tankers in search of strong open source solutions, along with good beer (affordable, if not entirely free)? Per the recent POSSE meeting, we'd need at least wireless. The consensus: it's not all about about Beaverton (or Nike either). We already have Free Geek in the right district. Nor are we closed to meat-lovers. Lucky Lab has a sandwich called Vegetarian's Nightmare. What Free Geek got right was the big dance floor with a sound stage up front, plus ample projection facilities. When a media company shuts down for the day, some workers want to party, and that may include projecting choice pieces from the archives, be these from current projects or from days-gone-by. Smaller screening rooms are likewise used for this purpose. Like many architects, geeks seek large warehouse type spaces, well suited to scenery changes, with ergonomic desks and ample access to kwhs. This is what Jerritt Collord tried to get going in Northeast. He was ahead of his time. Portland has been somewhat slow on the uptake I suppose -- a pitfall for towns that consider themselves more sophisticated than they are. Jerritt's talent was certainly recognized out in Hillsboro, West Precinct. Glenn Stockton also discussed the cultural anthropology behind the pant crease, how it signified "store bought" and therefore had to be put back with a hot iron after washing, to continue sending the right message about the wearer's social class. I'm sure there's a lot more to the story, including from a military angle (uniforms). Likely jeans will remain popular attire in the new PDX Tech District though. The health care sector is a likely primary consumer of our open source bioinformatics. I used to don a blue uniform, with shoe covers and a hair net, when working after closing time in CVOR. 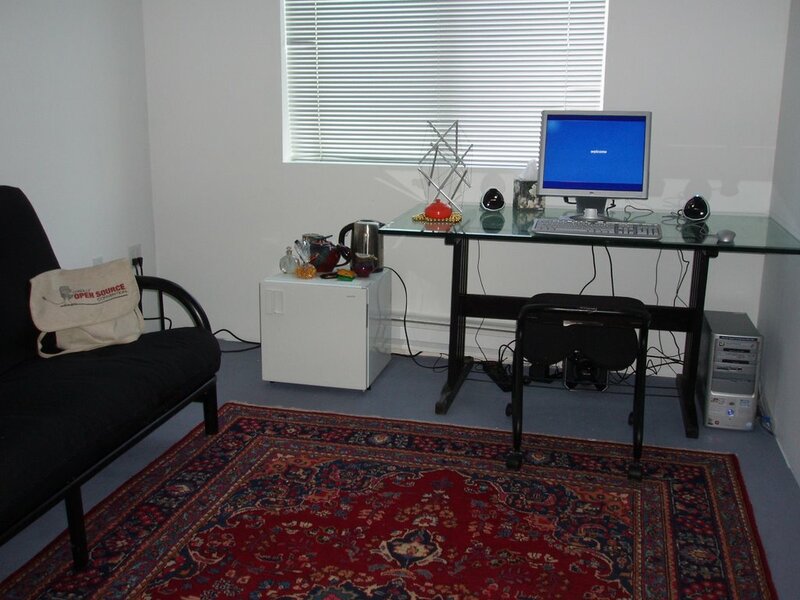 This was back when I worked for David Lansky at CORE (Center for Outcomes Research), on such projects as CLAIR (Cath Lab Angiograms and Interventions Registry) and CORIS (Cardiac Outcomes Research Information System). Suits connote "clueless" among many techies, though I've been wearing mine a lot lately, permanently creased with silicon. But the old IBM dress code never really caught on in our neck of the woods. Maybe we're just too much into henna tatoos and jewelry or whatever, not to mention spiky hair. Also, if public key N = p*q with p,q being big probable primes per Miller-Rabin, then the totient(N) is simply (p-1) * (q-1). Using the Extended Euclidean Algorithm (EEA), we compute: d = inverse(e, totient(N)) such that (e*d) % totient(N) == 1. So now d is the secret complement of public key N, presumably not derivable minus knowledge of factors p and q, and presumably N can't be factored in any reasonable amount of time (win big bucks if you're able to crack these large Ns). I've got more discussion of all this at the Math Forum under the heading of Gnu Math. Dr. Louis Bucciarelli got his name in lights on the marquee of the Schnitzer last night. This low key MIT professor studies engineers almost through the eyes of an anthropologist, but I think he would argue, really more as a fellow engineer, self-aware on many levels. His general message was positive: end users are getting more into the loop as influencing the design process. Today's "users" are less passive than yesterday's "consumers" -- and we may expect this positive trend to continue. Engineers have the ability to implement many possible futures. There's no "technological determinism" at work, no predestination. So they need to be steered, even as they become more self- steering, as not all futures are equally possible nor equally desirable nor equally worthy of our allegiance and focus. Some futures, even if very possible, just aren't worth our time and energy. So we need to prioritize and consult the oracles, figuratively speaking, to divine just what we really want to get out of our engineering. Our powers of invention have a way of giving us what we ask for over time, including nightmarish scenarios with technologies to match, if terror is what we're into. Bucky Fuller posited longing as equally motivational, and good at counter-balancing fear (Fuller credited Einstein for this "fear vs. longing" dichotomy, as well as for a non- anthropomorphic concept of God). Speaking of Bucky, some young voice in the audience, belonging to no one I recognized, asked during the Q&A what would be the outcome of this whole Fuller thing (paraphrasing). Bucciarelli professed mostly ignorance of the Fuller corpus, though attempted an answer, hinting over-zealotry was more frequently a flaw in scientists than engineers. You see, in Bucciarelli's object world (his terms), we may divide scientists from engineers in that the former claim to be discovering lasting truth (capital T sometimes) or generalized principles, whereas the latter just want to make something work in special case, a goal that may require frequent redesign and a rather short life cycle (or half life) for one's products. A different mindset. If Bucciarelli himself is any indication, the engineer's mindset breeds a certain quiet reserve, which I was not alone in finding congenial. Indeed, another young voice during the Q&A spoke to the entrancing quality of his voice and asked if maybe he hadn't read books on tape or something in a previous job. "I was a rock star" he said, "next question?" I went to the microphone to ask whether engineering firms might more formally identify key assistive disciplines and hire people into the firms under those job titles e.g. as bona fide anthropologists and psychologists. Bucciarelli said many firms already do that, at which point I inserted a special plug for philosophers. Later, during the dinner at the Heathman, I asked if maybe the engineers and lawyers were on a collision course, given optimizing solutions to human problems would entail leveraging our newfound ability to faithfully copy digital assets ad infinitum, whereas many colonists want to fence off large regions of our shared intellect (an invisible landscape) much as they did on the physical plain, for their proprietary/branded cattle and/or horses (so-called "livestock" vs. the dead kind on Wall Street). Having ideas stream freely, with no regard for fences or borders, makes a lot of private property minded lawyers feel antsy, to say the least. A freely copiable, high powered operating system like Linux seems like such a waste of a golden money-making opportunity to them. Engineers, on the other hand, see all these new users being well served by these new circuits (e.g. the Internet), a marvel at how little the lawyers' concept of money enters into it (which isn't to ignore the fact that our Internet is hosted and protected by monied institutions, DARPA for example). Bucciarelli's response mirrored my own thoughts on the matter: some lawyers will have a hard time keeping up with the changing times. But it's not like we're planning to let go of the whole notion of lawful and ethical behavior (that's me thinking). On the contrary, engineers are taking an increasing interest in user values and ethics. In the case of design science, for example, what counts as engineeringly sound may even synch with our ethical predilections i.e. keeping our designs free and open is what leads to fixes and improvements (smarter engineering), and is what keeps end users increasingly in the loop, increasingly educated about what really goes on behind the scenes, and therefore more able to really contribute and help steer (stronger ethics). All in all, this has been a great ISEPP season. The small cross-section of Oregonians managing to attend these lectures must now be among some of the most educated and up to date on our planet. My enduring thanks to Terry Bristol and Mentor Graphics especially (both the company and the foundation) for making it happen. The Wanderers have also played a vital and catalyzing role. I was at the First Congregational Church for a presentation by Eric Schlosser last night. He's finishing up his tour promoting Chew on This, a book for children about the history and impact of "fast fooding" in America. Calling it "fast fooding" is sort of an inside family joke: in Bhutan we'd sometimes see signs for "Fooding and Lodging" (a normal usage in India). However, the long term health effects of marketing junk food to children are no laughing matter. Childhood obesity and diabetes have reached epidemic proportions in the USA. I bought a copy for Tara, which Eric kindly autographed. Tara is already into it, finding it cram packed with interesting facts. She plans to make it the basis for a speech she's to deliver on Friday at her school. Should teachers and students be free to question media campaigns in class? I'd say that's the mark of a free society. If you've been intimidated into never questioning slick PR, you're not free. Mad Magazine, produced on Madison Avenue in the heart of New York's advertising district, was an early pioneer in this regard. Vance Packard's The Hidden Persuaders was another. If a democracy is to withstand the test of time, it needs a strong counter-culture to keep questioning its integrity. Democracy's enemies traditionally use "national security concerns" as their chief means of suppressing internal dissent. The USA's politicians tend to be quietly respectful of capitalism's invisible army of child and adult psychologists. Their media campaigns use the same clever tricks the artificial corporate personages use to inspire loyalty to their brands. Dawn's new workspace is coming along nicely. We went from an empty room with a utility sink to a functional office in just three or four days. She's recycling old props: the desk from an area center garage; the rug (on loan); the small refrigerator; the kneeling chair. The metal frame futon and computer are new: I assembled both, while Derek helped with the heavy glass and frame. 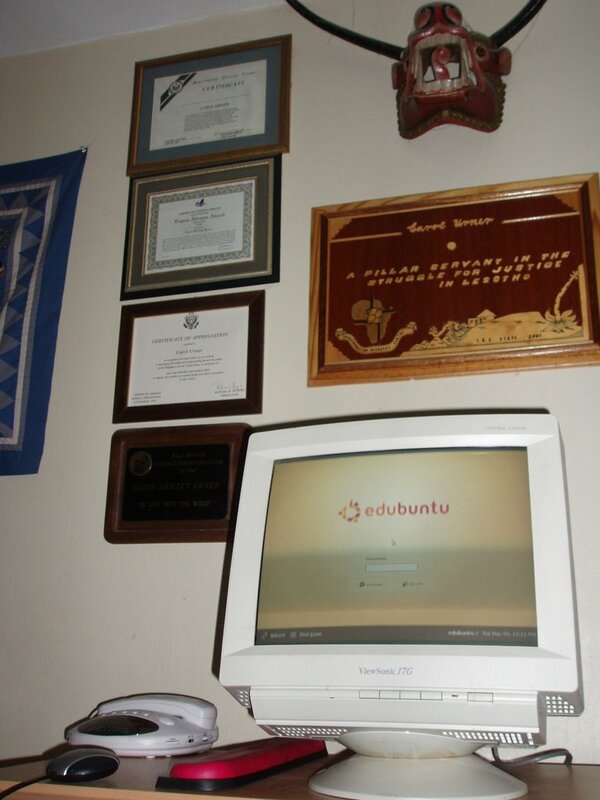 The computer, TurningWheel, is a Hewlett-Packard Pentium 4, has a gig of DDR and a 19" flat screen monitor. I drove out to Fry's for it, having seen the Mother's Day ad in the paper. The building has wireless, other amenities. Lots of artists and small businesses have set up shop here. I wrote this memo to math teaching community this morning. Based on prior experience, I expect little reaction from the USA-based teachers who currently frequent this list. Developing a more sophisticated approach to math teaching, using recent computer technology, is pretty much the furthest thing from their minds. After all, math through programming is not what the textbooks are about, and textbooks define reality to most teachers. 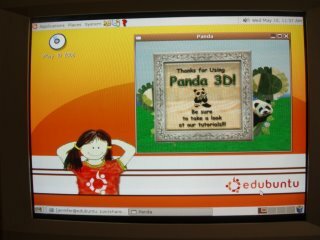 Anything outside of a textbook is seen as just pie in the sky dreamweaving, no matter how much free and open source material is made available via the Internet. Anyway, I'm not reporting any news here, just more of the same old same old. We've had to learn ways of working around the established math teacher networks and organizations. They're entrenched in their ways and not really relevant to our work. Derek lent me an old Compaq Deskpro he bought recently, one of five workstations. 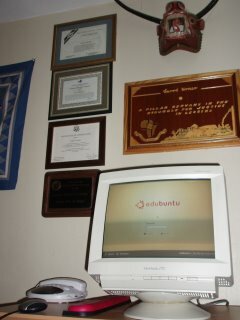 He put Suse 10 on one of them, Edubuntu on another, the one I'm borrowing. I've got it set up in Carol's office, which feels appropriate, given all the memorabilia she has from that part of the world, and from Lesotho especially. 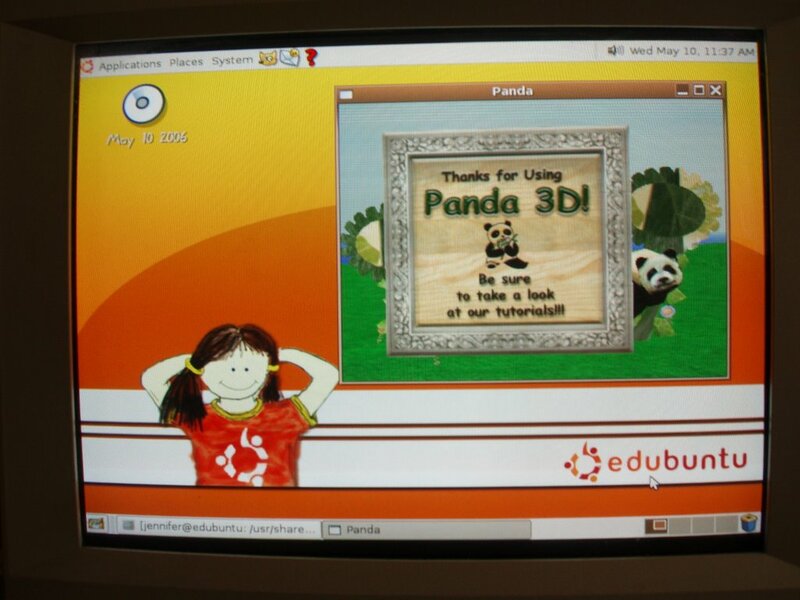 Maybe I'll be able to get Panda3D running on this thing. I saw two Ubuntu download options at the web site. Which one should I choose? Answer: breezy. I got this new Starbucks coffee-making appliance for Xmas, from me to myself (with a loving endorsement from family), which I've just stoked with Celebes, a favorite bean. Earlier I met Mark, Don's friend and former student based in Guatemala. We three plus Micheal Sunanda watched An American Haunting this afternoon, which I'll likely review one day soon. I'm biased though, having always been a big Sissy Spacek fan (good seeing Sutherland again too, liked him in JFK among others). Yes, I saw that front page article about the beautiful mind guy in Rm. 114, busting his brain to become famous. Checked into his stuff. Didn't see many hexagons (Glenn Stockton, on the other hand...). Maybe he'd like to present to Wanderers some time. Information gets lost going through newpapers and web sites, useful though these often are at providing valuable perspectives. I was telling Mark I think a problem with USA culture is we don't accept aid workers from overseas, think our job is to only export basic expertise. Think of this SNL skit: zoom in on some cute uniformed Chinese girl, propping up an SWI (slumped while intoxicated) in some Gotham, USA. "What are you doing?" the curious camera man asks. "I'm assisting a victim of western capitalism" she replies calmly, and flashes her badge: Communist Chinese Peace Corps. Scream! Anyway, you get my point. People are way paranoid here, don't want to get any help, just give it, even where it ain't really needed (at least, not in the form offered). So I just rushed back from this brew pub, a meeting of POSSE, where the governor of Oregon made a brief appearance (David Pool, whom I know from our CollabTech days at FreeGeek, pointed him out to me), and Erik Sten, a local city council member now running for re-election. Erik shared for a good half hour actually, taking a question from me about industrial sector zoning of the east side hugging the freeway. Would a "think tank economy" featuring such as the London Knowledge Lab, but Portland's, be apropos? Erik thought that'd be a swell idea, matched his own vision quite a bit. And no, I'm not forgetting his "render farm" idea either. A TV camera with a separate boom microphone showed up later, during the presentation on open source business models. People got more intelligently talkative. I thought we cut a great tape. I'm burning Sunanda CDs from a master at the moment. As yet I have no clue what he shared on KBOO last night. Funny hippie psychobabble is how he characterized it, in the minds of his listeners at least. I purchased Chinese food from Fujin, rented Sister Act and Sister Act 2 from the nearby Hollywood Video for Dawn and Tara, and picked up medicines at the Fred Meyer pharmacy. My hope is to visit with Jon Bunce (a Wanderer and musician) later this evening. Dawn spent much of the day working on her new studio space, which is rather near to the east side Lucky Lab.